Rescue, save, recover: Salvage can be defined in different ways. Devoting an exhibition to recycling and upcycling trash is itself a recycled idea, and not a small curatorial challenge. For "Salvage," the current show at Chandler Gallery in Randolph, multimedia artist and curator Josh Turk chose works that not only rescue discards but elevate them, even offering a sort of salvation to the wreckage. Turk, who lives in Bethel, is currently completing his MFA at the Art Institute of Chicago. He did not record a curatorial vision for the show in writing, preferring "to let the work speak for itself," he said. And it does, sometimes softly and sometimes carrying a big, recycled stick. The works by 30 artists range from freestanding sculptures to wall-mounted assemblages to sculptural pieces on pedestals. The paintings, collages and mixed-media works are comparatively conventional in form but defy the designation of "ordinary." Some works are exceptional for their ideas, and many articulate their visions through meticulous precision. Anne Leeds' eye-catching "God Bless America," a 68-by-48-inch wall hanging, is a good example of the latter. 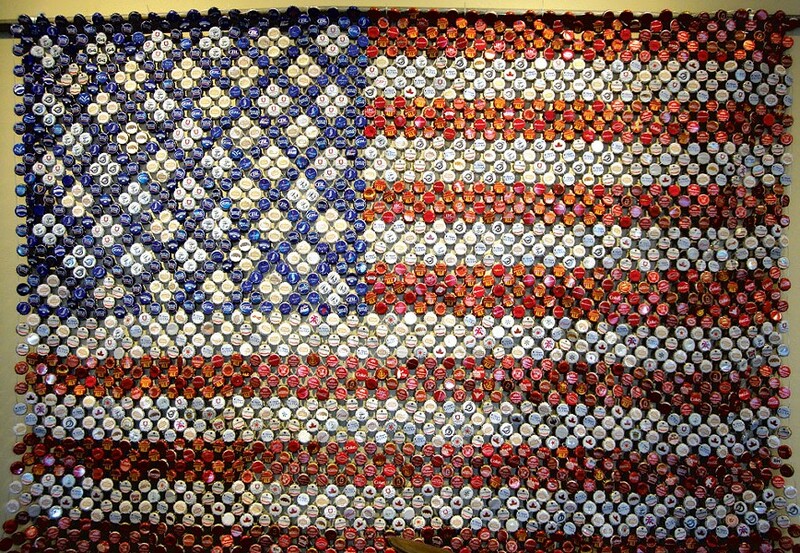 In this piece constructed of red, white and blue beer-bottle caps and galvanized wire, the colors are organized to resemble the American flag. Its size makes it the dominant piece in the show, while its symbolic imagery makes it instantly recognizable among 75 pieces of abstract art. The flag is iconic, but it is also much more. The Tunbridge artist's workmanship is particularly skilled. Leeds has arranged the bottle caps to create the impression of white stars on a blue background, much as a quilter would use fabric. She wove the caps together with galvanized wire that hangs from a rod, creating a work that can move and ripple like a cloth flag. This durable salvaged work is remarkable for its potential longevity as a work of art. "Watering Can," by Randolph-based contemporary furniture maker David Hurwitz, is a sculpture seated on a pedestal in front of Leeds' flag, like a companion piece. It, too, incorporates an easily recognizable element of Americana: a gleaming motorcycle gas tank. In Hurwitz's signature style of polished workmanship, the piece is impeccably crafted of stainless steel hoses, wood, steam-bent and carved ash, and brass fittings. Leeds has a second assemblage on exhibit that, like "God Bless America," is a surprising departure from her usual pastels of rural Vermont landscapes. "We Three Kings" (44.5 inches square) is made of olive-oil cans that have been cut, peeled and shaped to resemble ironwork. Its delicacy suggests cut paper or lace, eliciting images of Mexican folk art or Spanish iron scrollwork. Using oil on panel and oil crayon on paper, Leeds renders the three "kings": Jesus, Elvis and Dr. Martin Luther King Jr. The title may sound tongue-in-cheek, but the work offers a vision that connects these figures who have inspired so many. Despite the exhibit's size, the works don't seem crowded in the Chandler's spacious gallery. Larger works such as Meg Walker's "Stacked Barns," Gerald K. Stoner's welded-steel sculptures and Renée Bouchard's mixed media on board visually dominate the large, high-ceilinged rooms. But many excellent small pieces await discovery, as well. Two such works by Pat Harrington, "Tiles" and "Fair Light," are eclectic wall pieces both made of scrap wood and paint. They are lively, evoking jazz — as if the assemblages were a visualization of sound, frozen in time. Terry Gips' "Red at Night," a mixed-media wall piece mounted on wood, draws viewers in with color and entrances them with the lava-like flow of lead flashing. Her piece is simple, strong and stunning. Schuyler Gould's "Metropolis" and "Lighthouse at Alexandria" both incorporate functioning lights. In the former, antique bottles of various heights are mounted inside an old iron kettle. Flashing Christmas-tree lights illuminate this glass "city" from beneath, making the bottles look like buildings; their colors suggest the yellow of street lights and the orange of emergency utility vehicles. "Lighthouse at Alexandria" refers to Pharos, one of the Seven Wonders of the Ancient World. Gould stacked a foundry pattern and stove parts on top of one another and illuminated them from below, so they suggest a shadowy version of the ancient Egyptian lighthouse. The lighting takes on both literal and metaphorical significance as it draws visitors into its "safe harbor." Burlington artist Kate Longmaid has three works on exhibit. "Rapture and Rupture" incorporates a black-and-white portrait painting, a vintage dollhouse and broken china. Measuring 23.5 by 27.5 by 11 inches, the assemblage stands on top of a wooden bar that makes it appear much higher. Placed near the gallery entrance, it presages the emotional content and personal connections that viewers may find in the exhibition. 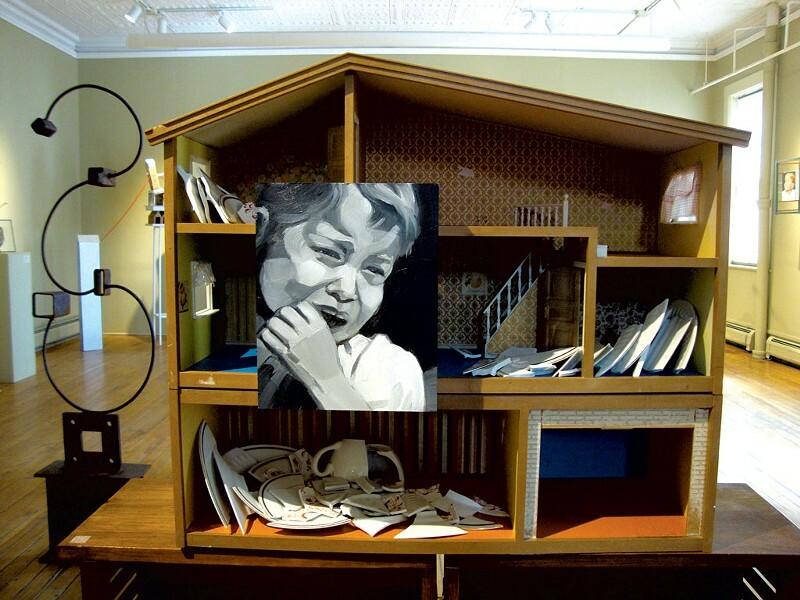 Longmaid's piece suggests the power of childhood memories, like those that dollhouses may elicit. No salvage-based exhibit in Vermont would be complete without work by Cabot artist Janet Van Fleet. This one includes five of her mixed-media works. During this writer's visit, the 21.5-inch high "Men's Cabinet" attracted many gallerygoers, perhaps in part because Van Fleet invites viewers to open it. Inside, the cabinet resembles both a tiny curio shop and a dollhouse, with its invisible fourth wall and three levels. It holds some miniatures, including a piece of dollhouse furniture, along with human-scale objects such as full-size photographs. The piece suggests a glimpse into an unknown family's history. Another crowd favorite is Phil Godenschwager's "Portrait of Artist as a Young Man." Wood, steel and found objects are housed in what was once a candy machine made of glass. A metal Nixon/Lodge campaign button rests tucked behind layers of toys and ephemera. It's a time capsule representing many decades, from the artist's childhood to adulthood. One more work must be mentioned. "L'ombrellino Nella Vespa," by Ronni Solbert, consists of a skeleton of a Japanese parasol that has been re-covered with the paper from three wasp's nests. Railroad-tie nails, a metal pipe and steel create the rest of the umbrella; lace and a glove at the base complete it. These materials keep the umbrella aloft at floor level, as if someone were holding it from beneath the floorboards. The 90-year-old Randolph artist is toying with us. The works in this show have been resurrected from junk to art. In "Salvage," Turk presents a show that transcends its genre.